In a small bowl add pineapple, mango, red onion, fresh cilantro, lime juice, and salt to taste. Stir to mix everything together and set aside. In a small bowl add cajun spice seasoning and garlic powder. Mix. Pat Mahi Mahi filets dry. Season both sides of Mahi Mahi with cajun seasoning mix. Heat a large skillet to medium high heat, add grape seed oil. 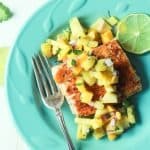 Place Mahi Mahi in pan and sear for 2-3 minutes per side. Remove and let sit for 1 minute to cool.